one of the eight great bodhisattvas who were the closest disciples of the Buddha. In this form, he sometimes appears whitish-green in colour and holding a lily to symbolize renunciation of the destructive emotions. the embodiment of the knowledge and wisdom of all the buddhas, traditionally depicted with a sword in his right and a text in his left hand. 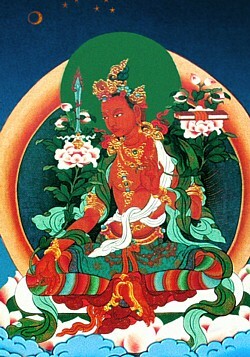 In definitive terms, Mañjushri, you are now, and from the very beginning you have always been, a genuine buddha, in whom all the qualities of abandonment and realization are totally perfected, because you completely traversed all ten bhumis, such as the Joyous and so on, and purified the two obscurations, together with any latent habitual tendencies, many incalculable aeons ago. Nevertheless, from a merely provisional perspective, you appear as the foremost of all the bodhisattvas, and demonstrate the means of training as a bodhisattva in the presence of all the victorious ones and their heirs throughout the ten directions.